Comprehensive treatment and follow-up care are the best ways to help control early and late treatment side effects and comorbid health problems By following post-therapy diagnostic schedules with screening, detection and diagnoses by physicians, the medical team and specialty consultants can improve cancer care with earlier treatments. Over the last thirty-five years, the number of cancer survivors has increased from 3 million to over 10 million. This, in part, is because of the many new advances in surgical, radiation therapy and medical treatments, as well as scientific research advances that have occurred in recent years. 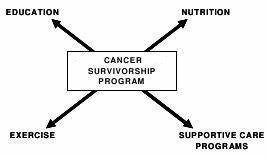 Following their treatments, survivors can be cured or achieve a remission, but the survivor's journey is often a rough road, as there can be side effects in the recovery phase or later from the cancer or the treatments, and the possibility of a recurrence or even a new cancer. This presents many concerns and anxieties that survivors must face. This booklet is a summary of a more extensive book, Everyone's Guide for Cancer Survivorship. It is important to follow the healthy guidelines extracted here from the larger work to help promote and maintain the best health possible, prevent co-morbidities, reduce the risk of recurrent disease, and perhaps prolong survival. The information in this booklet presents opportunity and challenge to cancer survivors who wish to remain in the healthiest state possible. By following the recommendations and guidelines provided in this booklet, you can make more informed choices and decisions that will promote better health and survival.